Just Jingle: Skipping Stones December with Canvas Corp. It's a new month and an exciting one at that over at Skipping Stones Design! We have joined together with the fine folks over at Canvas Corp and let me tell you, this is a fabulous combination! YAYA!!!! Seriously...have you ever used their stuff? I'm in LOVE!!!! Let's start with my card for today, K? K. Thanks. Yup. TOTALLY fun!!! 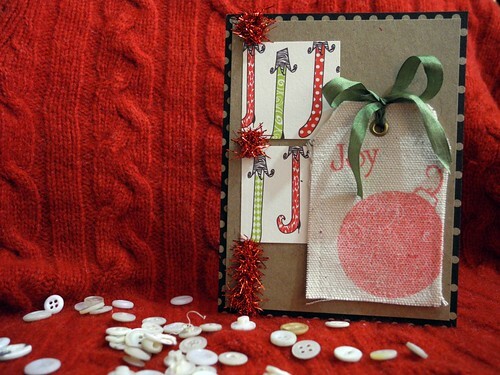 The stamps are from the Christmas Swirls set and they stamped beautifully on the Canvas tag from Canvas Corp! 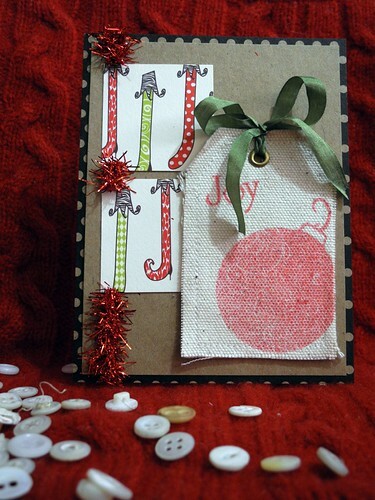 I also used patterned papers from Canvas Corp and I am LOVING the kraft and adorable Christmas patterns!!! I added the eyelet to the tag and tied it with May Arts silk ribbon. I love that stuff! The tinsel is American Crafts and super fun! It's all so CHRISTMASSY!!!!!!!!!!! I'm a big fan of Christmas. Just say'n. SO...here's the deal...go check out what our amazing guests, partner, and design team have created! It's PARTY TIME, folks!!!! Then you TOTALLY need to create a card based on the sketch over at the Skipping Stones Blog and link it up for your chance at FREE STAMPS! You don't have to use SSD stamps to participate, so jump in with whatever you've got! Go check 'em out and don't forget to join in with your own card!!! P.S. Check out this amazing giveaway! This is not related to my post, but it is AWESOME. Just say'n. EEEEEGADS! I am SOOOO appreciative of this post because I have a LOAD of 18 and 22 inch counted cross stitch fabric that I bought YEARS ago when I had vision in both eyes, and can no longer USE it! (I have to use 14 count now.) Your gorgeous card inspired me to get up and go pull out a piece and STAMP on it - just to see how it would look! AMAZING!!! Love that card you made & the canvas tag! Love YOU! Now I'm going to check out the REST of the sketch artists! THEN I'll have myself some serious FUN creating with, and stamping on Aida cloth! so cute...love that canvas tag...great card.. Cute card! Love the stamped canvas tag! What a fantastic project...love Canvas Corp and all their crafty stuff. Love how you used that canvas tag...I have one of those that I am now officially inspired to use. GREAT card and the canvas tag is PERFECT - Love it! gorgeous, love that canvas tag! Super cute card! Ummm, I do like free stamps, you are making this very tempting . . . supposed to be baking Christmas cookies today, but stamping sounds pretty good . . .
My Gingersnap Creations art exchange package came yesterday--I was delighted to receive one of your adorable ornaments, thank you so much! How super fun and adorable!! I love your long stocking panels, and that canvas tag is jut the sweetest!! This is fab- just like you! love canvas corp and your card is adorable using the tag that way!!! beautiful work!!! Your card ROCKS!!! I wanted to stamp on my canvas too!!! I will soon!! I hope you had a good Tuesday!! Soooo pretty! Love the details. 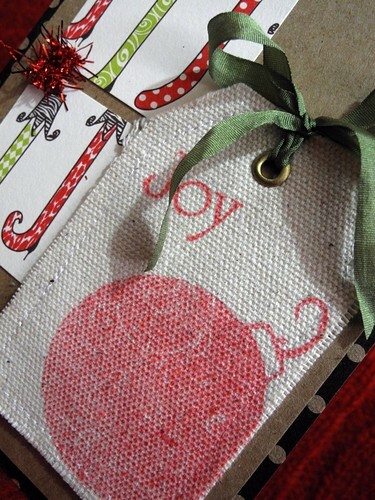 Jingle.......I absolutely love how you stamped on the canvas tag! It's so adorable! Eeeee so cute Jingle! I love the canvas tag! morning! cute as always! but what I love about your blog, is your cheerful energy! thanks for sharing your happy little self with us! This is adorable!!! Love that you stamped on the canvas tag! Very cute!!! love this...awesome stamping on the canvas! So sweet! I love the look of the ornament on that canvas. Fun card, I love the stmaps that you used!! Neat idea to stamp on the canvas!